Dr. Kundandeep Nagi is a board-certified ophthalmologist who is fellowship trained in Clinical and Surgical Glaucoma. He provides comprehensive ophthalmology services including state of the art cataract and glaucoma surgery. Dr. Nagi completed his residency training in Ophthalmology at Albany Medical Center Hospital in New York. He pursued further training in an AUPO certified fellowship in glaucoma and advanced cataract surgery at the University of Texas Health Science Center at Houston. Dr. Nagi is the former Assistant Program Director at the University of Texas Health Science Center at San Antonio, Department of Ophthalmology. He served as the Chief of the Glaucoma Services at UTHSCSA in 3 clinics for 5 years. He has trained the residents of UTHSCSA in cataract and glaucoma surgery, many of whom are now glaucoma trained subspecialists throughout the nation. He is an author of multiple journal articles and book chapters. 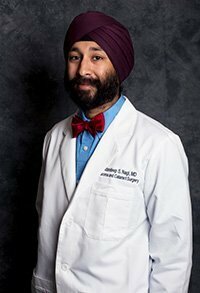 In addition, Dr. Nagi served as the Director of Medical Student Education – teaching and leading many medical students to successfully pursue training in ophthalmology. Dr. Nagi is a 2015 recipient of the prestigious “40 under 40” award, an honor given by the San Antonio Business Journal that recognizes the most talented, successful and community-minded professionals. He introduced new and advanced surgical techniques in the treatment of glaucoma and cataract during his tenure at UTHSCSA. The SA Scene Journal has consistently nominated him as one of San Antonio’s “Best Doctors”. He is very active in his local community and regularly participates in health fairs and educational events. Taking advantage of the unique state parks that Texas has to offer, Dr. Nagi enjoys many outdoor activities with his family.